Are you looking for simple and pleasant ways to keep New Year’s resolutions on track this year? Here at Aqua Spas and Pools, we have a few tips to keep New Year’s resolutions within your grasp. Simply hook up your hot tub or call one of our experienced spa set up professionals and consider these five benefits of hydrotherapy that can help you achieve your wellness goals in 2018. Far too many people feel the pressures of juggling priorities such as work, family, school, community obligations and their hobbies. All of this daily multitasking takes its toll on the body and results in stress, which is a leading health concern today that can lead to elevated blood pressure and cortisol levels. The moment you step into a hot tub, the de-stressing begins. Consider adding spa-approved relaxation oils, breathe in deeply and simply unwind your way to better physical and emotional health. If weight loss is one of your goals, you’ll already be promoting this New Year’s resolutions by unwinding with hot tub therapy. Not only does hydrotherapy help reduce cortisol levels but it also helps you build muscle which boosts metabolism. Furthermore, it helps aid blood flow to promote better digestion that can assist with weight loss. If you want tips to keep your New Year’s resolutions for better overall health and wellness, hydrotherapy has remarkable healing benefits to help you achieve target goals. If exercise is a part of your fitness plan, soaking in the hot tub helps relieve muscle tension, pain and relieve after-workout stress. Using a jetted hot tub stimulates the lymphatic system and helps flush toxins to boost immunity—a vital aspect of health. Those with busy, high-pressure lifestyles often resolve to spend a bit more time with their families this year. However, you don’t have to plan outings or vacations to do just that when you have a jacuzzi in your backyard. 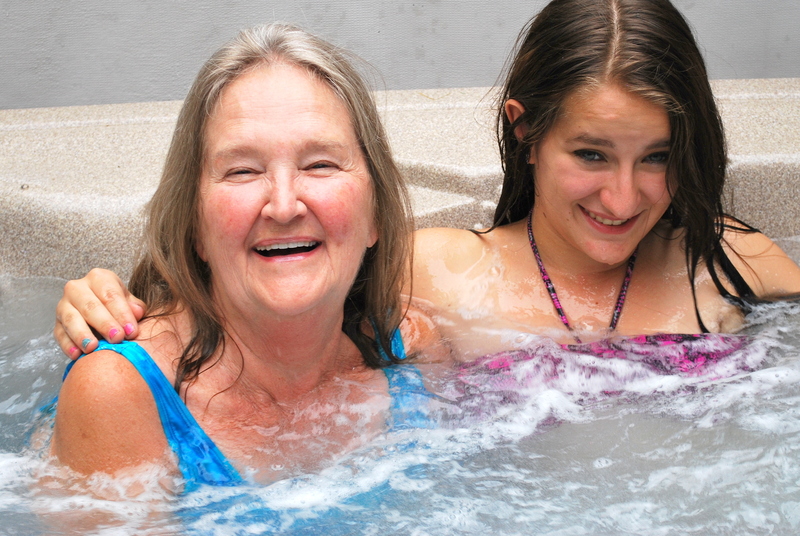 Individuals of all ages can enjoy the benefits of hydrotherapy and it’s a great way to disconnect from the world while reconnecting with each other. Don’t have a hot tub? The professionals at Aqua Spas and Pools can help you with tips for choosing a family hot tub. If you have resolved to start a low-impact regimen of yoga, perhaps you should consider hot tub yoga poses, which offer many of the benefits of Bikram “Hot” Yoga but with less stress on the body. You can perform many strength and flexibility-building yoga poses right in the hot tub. With practice, the body begins to feel more balanced both emotionally and physically—without the sweat of hot yoga. De-stress your mind and body while leaving the woes of daily stress behind. Meet weight loss goals with muscle building and metabolism boosting hydrotherapy. Boost overall health with jetted hot tubs that help eradicate toxins, improve circulation and promote wellness naturally. Spend more time with the family without even leaving home. Increase balance, strength, and flexibility. Whether you’re looking for a new hot tub or just need an experienced spa professional to hook up your hot tub and prep it for the season, contact Aqua Spas and Pools in Gig Harbor today.